Joseph Megless grew up in Chester County Pennsylvania and moved to the Warrenton area in the late 90’s. Close relatives introduced him to golf when he was 13, and since that time his clubs have never been out of reach. His passion for the game led to success during his high school career at Highland School. Joe was named a Washington Post three time All-Extra Selection, a three time conference MPV, and a Delany Athletic Conference individual Elite tournament champion two of his last three years. 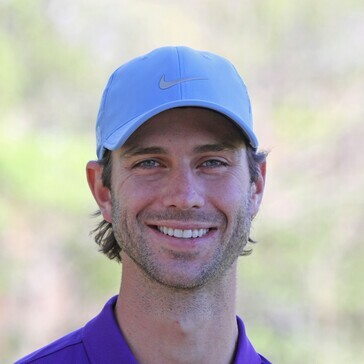 He attended Virginia Tech and spent his summers competing in numerous amateur tournaments highlighted by a win at the 2009 Northern Virginia Four Ball Championship. After graduating with an economics degree, he pursued his dream of playing professional golf. After spending the last 7 years on Florida’s mini-tour circuit, he returned to Virginia to work as a coach and instructor for Larkin Golf. Erika Larkin was voted 2015 Best Teacher in Virginia by Golf Digest. Joe is committed to sharing his experience and knowledge of the golf swing to help others improve their game.